Hannah Maybank is well known for pushing the boundaries of painting as a two-dimensional discipline through her transformation of the flat painterly surface into one that ripples, splinters, overlaps, and protrudes. In this new body of work she combines the three-dimensionality of her sculptural surfaces with the conventions of historical landscape painting and illusory perspective. It has long been suggested that if a painting is created in such a way as to draw attention to its own method of construction, the visible method of creation undermines the success of illusory representation. The material presence of paint and its method of application creates tension between the paintings own reality and the representational scene depicted on its surface. Calling attention to their own material fragmentation, Maybanks works deny the possibility of painterly deception. However in works such as The Invitation and Mirrored Oaks, she has turned to the illusory possibilities of painting. Pathways lead our eyes from the foreground of the painting, through clusters of trees towards a horizon. Embracing the conventions of the landscape genre, Maybank finds herself in a better position to rupture its pretence. The works begin as series of fluid, almost calligraphic ink drawings. 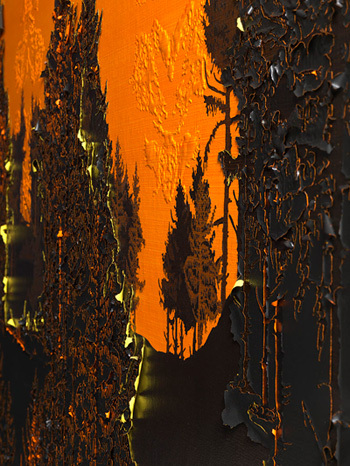 The tree silhouettes can be found repeated and resized throughout Maybanks canvases creating divisions and protrusions across the monochromatic field. This repetition de-familiarises consensual conceptions of the landscape while re-affirming her longstanding relationship with the cycles within life and the life of a painting. These paintings offer a position where certain information is sought and given slowly, where the paintings, through content, composition and process, grow and die, are built up and then fall apart. They are an invitation into an illusion, an invitation into their making and an invitation into the cycle of things. This is Hannah Maybanks third solo exhibition at Gimpel Fils. This year her work was exhibited at the New Forest Pavilion, at the 53rd Venice Biennale. She had a major solo show at The Hatton Gallery, Newcastle in 2008, and was artist in residence at ArtSway, in the New Forest in the winter of 2007. Her residency at ArtSway culminated in a solo show there in spring 2008. She lives and works in London. In Nordic mythology, two ravens, Huginn and Muninn perch on the shoulders of Wotan, sometimes known as the raven god. Wotan was lord of both war and poetry; destruction and beauty were characteristics of the same being. Each day, Huginn and Muninn would fly all over the world, returning to report their observations of mans embroiled battlefields. The birds, who only spoke in poetry, were both watchers and participants in the destruction. Camilla Symons is fascinated by the rich descriptions of often dark and sinister events in traditional fairytales, folklore and myths. In her first solo exhibition Symons presents a series of delicate silverpoint drawings that echo the dramatic combination of innocence and mortality found in these narratives. Building upon the vocabulary of animal images and symbols found in folklore, music and childhood stories, Symons depicts the baby bird that has fallen from its nest, the myxomatosis rabbit, or the crow with the broken wing. Combining the macabre and melancholy with a technique of drawing favoured for its delicacy, she meditates on the realities of life and death. Symons notes how, as an adult looking back on childhood discoveries of wounded animals, events that at one time seemed brutal, are looked upon with a resigned sadness and acceptance. Flight, or rather a thwarted flight, is a recurring theme in Symons work. A broken wing is pictured, isolated from its body; a cluster of delicate feathers is beautiful in structure and form but lies still, useless, acting as a reminder of our vulnerability. In her film, Sweet feed the lowly a group of earthworms writhe through an arrangement of feathers. The combination of flesh and feathers creates a startling juxtaposition of textures. As the worms entwine bird feathers, conquering their predators Symons experiments with symbolism and meaning. Enchantment, mystery and beauty combine with the fleshy and the decaying in Symons drawings. The technique of silverpoint was once favoured by Renaissance draughtsmen, who admired it for its fine lines and evocative qualities; qualities that Symons harnesses in her works. Initially, marks of silverpoint appear silvery-grey, but when exposed to air, tarnish to a warm brown tone. The oxidation becomes perceptible over a period of several months and in Symons work, the natural evolution of the silverpoint marks echo the ethereal nature of memory and the imagination. Originally from Aberdeen, Camilla Symons gained a First Class degree in Fine Art at Dundee College of Art in 2008, where she was also awarded The David Gordon Memorial Trust Award and The John Milne Purvis Prize. She has exhibited in several group exhibitions including: Roar! 08: Recent Scottish Graduates, The Gallery at OXO and Bargehouse, London, September 2008 and New Contemporaries, Royal Scottish Academy, Edinburgh, February 2009 receiving the Friends of the RSA award. This is her first solo exhibition.